FREE – Drop-in Activity while supplies last. 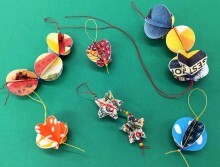 Learn to make a simple decorative ornament or garland out of papers like the fun Cavalini printed papers from Italy! It’s a great way to use the decorative paper you’ve been collecting! Makes a delightful gift.